Does Facebooks Ad Tool Mislead Voters? Facebook Inc. users who are worried that advertisers harvested their data to manipulate them with political propaganda have a potentially powerful tool to break the spell: a button on the corner of each Facebook ad that says, “Why am I seeing this?" As co-founder Mark Zuckerberg and his government regulators grapple with the Cambridge Analytica scandal and alleged 2016 election meddling, Facebook’s “Why am I seeing this?" button is an innovation with great promise. By letting users know why advertisers have chosen them, it has the potential to burst partisan bubbles that isolate voters, and to expose the micro-targeting used to divide the electorate. It’s also a window into the heart of what Facebook really is as a business: an ad company that makes its money from advertisers that employ user data to target their audience. For now, though, the button’s promise of transparency risks being fake news itself—precisely at a moment when the U.S.’s November 2018 elections loom as the company’s shot at redemption. I got a view of the function’s shortcomings while plunging into this month’s Italian elections as a dry run for the U.S. midterms. The plan was to lay bait for information warfare and then see where the algorithms and ad settings would take me. The box that popped up provided perhaps the least-transparent explanation possible. I’d been targeted because the candidate in the ad “wants to reach people ages 13 and older” in the Italian region that includes Rome. Facebook had simply spat back the site’s minimum-age requirement and the location of my computer. What I was seeing anecdotally, it turned out, was being confirmed with data. Coincidentally—two weeks before the Italian vote—a group of European and U.S. researchers presented a paper that examined the function on a global scale. They’d placed thousands of their own ads aimed at volunteer Facebook users who’d installed tracking software on their own computers. The code scooped up the explanations Facebook provided for the ads on the receiving end. Because the researchers were themselves the advertisers, they were able to compare the actual targeting parameters with what Facebook disclosed to users. “Across all our experiments, we consistently found that Facebook’s explanations are and sometimes ,” they wrote (italics included) of their research, which was funded in part by the U.S. government’s National Science Foundation. Matt Hural, a product manager at Facebook, said it’s wrong to conclude that the function prioritizes the largest or most common attributes. “We consider a lot of signals to decide which information a person will find most useful, so what is shown can vary a lot,” he said in a statement. Facebook created the tool in 2014 to give users more control over the types of advertisements delivered to their screens. It was accompanied by a menu of interest areas Facebook attributed to the users. If someone was getting ads for electronics stores because she’d been shopping around for a TV, she could delete “televisions” from her ad-preferences profile. The transparency has paid unexpected dividends. Last year, data compiled by ProPublica for a project about political ad placement exposed how companies excluded older users from employment ads on Facebook, raising concerns about age discrimination. For voters, the danger exposed in the 2016 election was that they couldn’t know if, or how, they were being singled out. In the days before the 2016 vote, first reported that the Trump campaign was targeting specific slices of the nation with tailored messages. The campaign used Facebook “dark posts”—nonpublic posts whose viewership the campaign controlled—to target black voters with an animation of Hilary Clinton’s 1996 suggestion that some black men are “super-predators.” The Trump campaign also tried to drive down black turnout in Miami’s Little Haiti neighborhood with targeted messages about the Clinton Foundation’s controversial operations in Haiti. 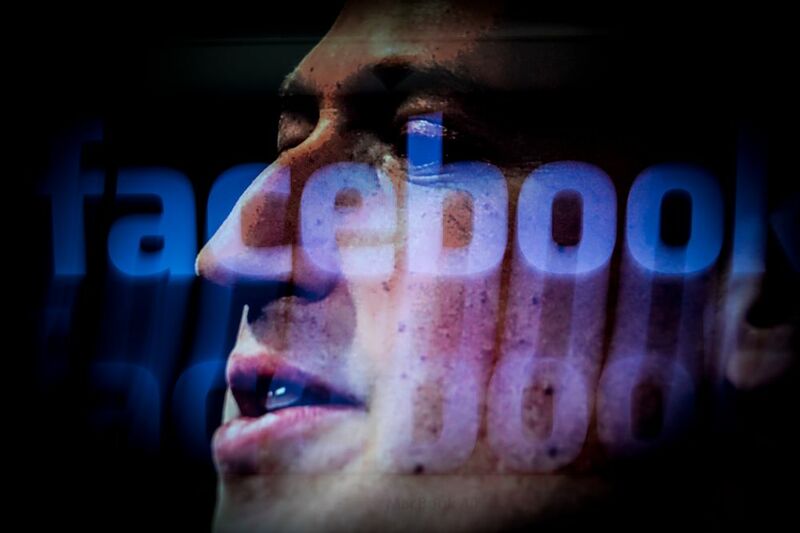 With this year’s congressional elections eight months away, Zuckerberg has responded with new transparency measures aimed at showing users who is behind the ads they are seeing, going beyond the “Why am I seeing this” button. Facebook is testing the new effort in Canada and plans to have it running in the U.S. by summer. The plan is for all users to be able to access an archive of every political ad and who paid for it. There’s no announcement, however, that Facebook will make the targeting itself more transparent—or the information it provides users completely truthful. In fact, one aspect of the button that the researchers and I ran into could, at best, be described as cheeky misdirection—and, at worst, fabrication. It occurs when users get a two-part answer to why they are seeing an ad. I encountered this when an ad appeared on my page for a private school in Miami that friends have attended and enrolled their kids. When I clicked the button, the first half of Facebook’s explanation was spot-on: The school’s alumni group wanted to reach people whose friends like their page. That was me. But then there was a second half that didn’t ring true. “There may be other reasons you’re seeing this ad, including that Ransom Everglades Alumni wants to reach people ages 18 and older who live in Italy,” it said. As I suspected, and the researchers confirmed, when Facebook gives users a second possible explanation, it simply provides the current location of the user, even if that wasn’t a variable requested by the advertiser. 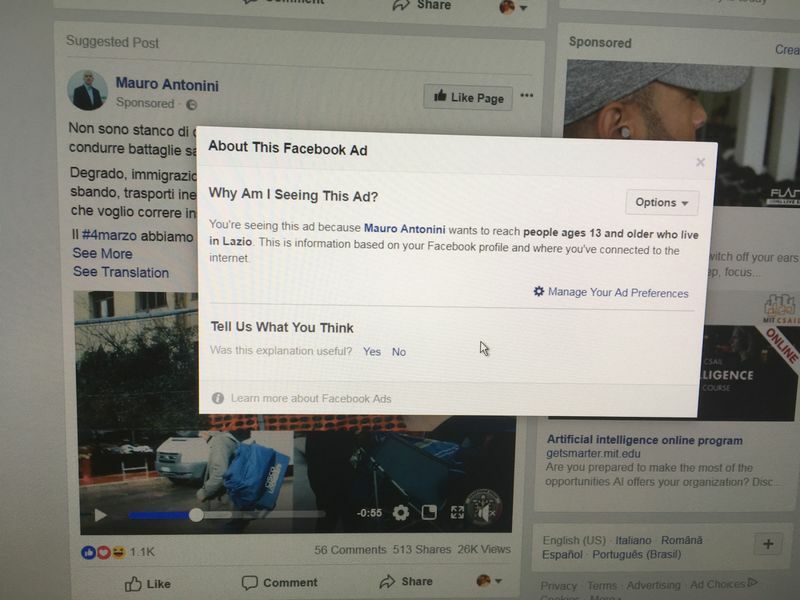 “This shows that Facebook adds potential attributes to ad explanations that advertisers never specified in their targeting, which makes them misleading,” they wrote. There are possible solutions (and plenty of time) before Americans head to the polls. If Facebook decides it can afford to further draw back the curtain on its advertisers, it can tell users the narrowest or most sensitive criteria used to target them, not just the broadest. Or it could even disclose all the reasons.